Suede high heels can be stretched and made more comfortable, but you have to be careful. It is pretty easy to overdo it as suede is a special material. So suede high heels are easy to stretch, yes. 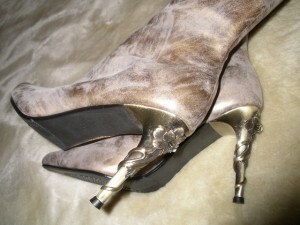 Often it is said that you can use the same methods to stretch suede high heels as you would leather. In general this is true, because both are real materials. Faux leather for example does not stretch at all or very, very little. Genuine leather stretches a bit and suede can be stretched the most. 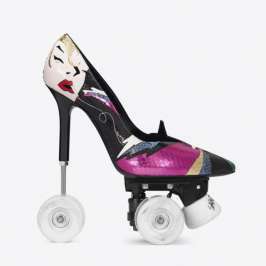 This means that if you’re not careful, you can easily overdo it and ruin your shoes. This also means it is better to get a pair that is a tad bit too tight and loosen it instead of getting one already a bit too big and have it go way too big when the suede stretches naturally as you wear the high heels. But sometimes you might have to help them. The problem with suede is that it can be very delicate and you could easily damage it if you are not careful. So one option is to buy a shoe stretcher and shoe stretching spray. The spray acts as a softener to the suede and makes it easier to stretch and not be damaged. So first spray the shoes in accordance with the instructions on the spray. Usually this means giving it a nice cover both on the inside and outside of the shoe. If you want to stretch out only specific area(s) of the shoe, then coat only them with the spray. For example just the toe box. If you are stretching the entire shoes, then place the shoe stretchers in them after they are sprayed. Leave them overnight. Repeat if needed. Go slowly so not to overdo it. If you want to stretch only a part of them, then simply put them on after the zones have been sprayed. Walk around the house and repeat a couple of times until you’re satisfied with the results.